Compared to its Asian counterparts, Tawainese cuisine has never really enjoyed much of the spotlight in London’s restaurant scene, but all that is fast changing with family-run Bao, the brainchild of bright young things Erchen Chang, her husband Shing Tat Chung and his sister Wai Ting Chung (all of whom are under 30). Bao’s inventive take on Taiwanese-inspired grub is inspired by the Xiao Chi, or ’small eats’ stalls the trio frequented while travelling around Erchen’s native Taiwan. The fact they have the backing of Karam, Jyotin and Sunaina Sethi - the F&B hit maker siblings of Gymkhana,Trishna and Lyle’s fame - speaks volumes. 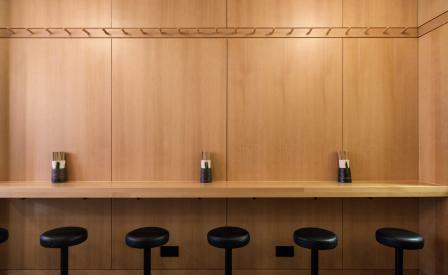 The eatery has nicely transitioned from popular street-food stall in Hackney’s Netil Market to fully-fledged permanent dining space on Soho’s buzzy Lexington Street, putting it in good company with nearby independent boutiques like A.P.C. and Aesop. And stand out it certainly does. Classic Taiwanese flavours, such as the combination of peanut powder and coriander and Thai basil infused into soy-based sauces underpin a fresh, innovative menu. At the heart of Bao’s story is the gua bao, a steamed milk bun originating from Taiwan, traditionally filled with slow braised pork, peanut powder, coriander and fermented mustard greens. Variations such as the melt-in-your-mouth confit pork bao and the devilishly crispy fried chicken bao presents some beautifully paired flavours and textures. But not everything is dedicated to the restaurant’s namesake - expanding on Bao’s street stall offering, the team has also created a starter-like selection of Xiao Chi dishes such as guinea fowl chi shiang rice and trotter nuggets. Don’t let the squeamish factor of some of the more unusual ingredients put you off. The Century Egg - a preserved egg fermented in a saline solution and buried for several months until it turns almost black - has been wonderfully paired with eryngii mushroom and garnished to taste perfection. Queue-averse patrons should try to visit during quieter periods, as the pocket-size restaurant doesn’t take bookings and a 40-minute wait outside for a table isn’t uncommon.